1. Fire officials are warning that the death toll from the fast-moving Valley Fire in Lake County could rise, as they receive more reports of missing residents, the Santa Rosa Press Democrat reports (h/t Rough & Tumble). Leonard Neft, a former reporter for the San Jose Mercury News, is among those reported missing, the Chron reports. One person is already confirmed dead — a former teacher who had advanced multiple sclerosis and was unable to flee the blaze. 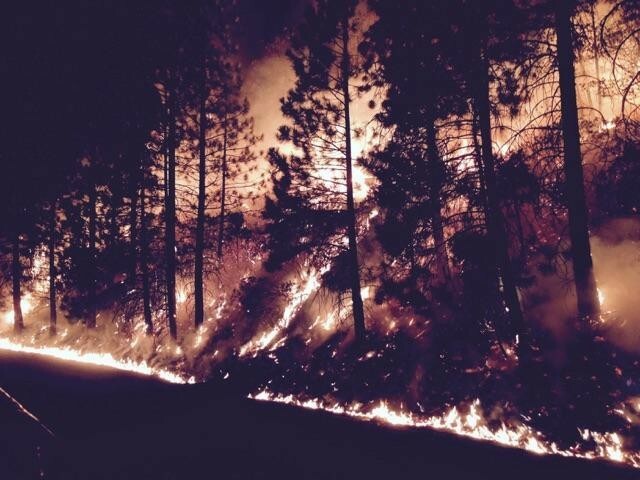 The Rough Fire is one of three major blazes still burning in the state. 2. Firefighters battling three major blazes in the state could get some relief today, because light rain is expected to roll into Northern California, the Chron reports. The storm could also bring some snow to the Northern Sierra in areas above 7,000 feet. 3. The Obama administration has agreed to deal that would forgive a $350 million debt owed by the Westlands Water District, a powerful agency that represents large agricultural interests in the dry Western San Joaquin Valley, the LA Times$ reports. Westlands owed the money from the construction of the Central Valley Water Project, which brought Northern California water to San Joaquin Valley farms. In return for the debt forgiveness, the federal government will not to pay for drainage of toxic land in Westlands. Environmentalists quickly decried the deal, which still must be approved by Congress. 4. Governor Jerry Brown has a bill on his desk that would establish the strictest rules in the nation on the use of antibiotics in livestock, KQED reports (h/t Rough & Tumble). Widespread use of antibiotics by factory farms has led to the rise of so-called super bugs — virulent and deadly bacteria. 5. And death penalty opponents announced plans to collect signatures for a 2016 ballot measure that would eliminate capital punishment in California and replace death sentences with life without the possibility of parole, the SacBee$ reports.